I probably shouldn’t have been as surprised by this fact as I was: I came across an article that said you have to throw away the entire loaf of bread if you spot a piece of mold on it, since the “tentacles” of mold have likely invaded the entire thing. With alarm, I reported this news to my husband, who said he learned this back in fifth grade (not, it should be noted, that this causes him to throw away moldy bread any quicker). When I was in fifth grade, I was learning how many times Jesus fell in the Stations Of The Cross (three times), not this potentially life-saving anti-mold information. I’ve already learned to view my sponge, my dishtowel, nay, my entire kitchen with considerable suspicion. But what about the potential mold lurking in the cheese drawer? I have seen green, fuzzy spots pop up on bricks of cheese as often as I have on hunks of bread. But cheese, even a science-illiterate like myself could tell, is less porous than bread. Did I still have to throw the yellow brick away? And did this rule vary with different types of cheeses? Carie Wagner, Wisconsin’s only female master cheesemaker and the cheese and egg product manager at Organic Valley, points out that, after all, when you eat some cheeses—like blue, Brie, and Camembert—you’re basically eating edible mold. As I suspected, some of those soft cheeses are more susceptible to growth than hard cheese, as “molds have ‘finger-like’ growth and can spread through these cheeses more than what might be visible.” Welp, at least I’ve got my terrifying 2018 Halloween costume figured out. It’s like Stranger Things’ “Upside Down,” but of cheese. 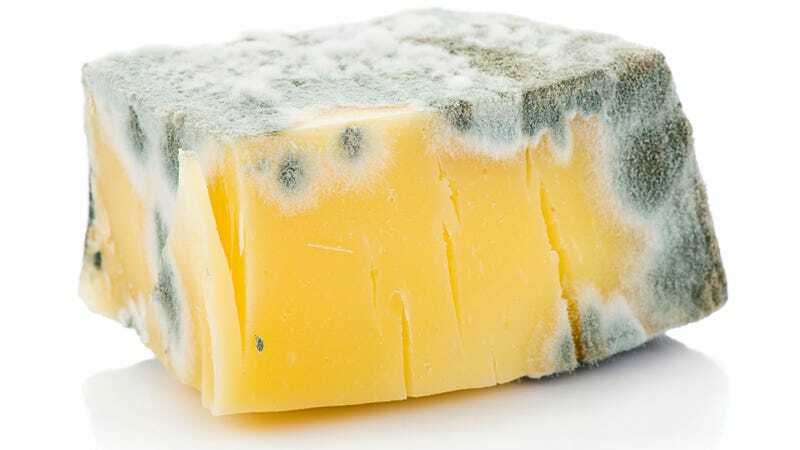 So if mold is present on soft cheeses (such as cottage cheese, cream cheese and ricotta), or any kind of cheese that is shredded, crumbled, or sliced... toss it. Toss it all! For other cheese types, you can go the surgical angle, cutting out the yucky stuff with precision, and keeping the rest, because “mold generally can’t penetrate far into hard and semisoft cheeses.” Thank goodness. So for your cheddar, colby, jack, parmesan, and Swiss, she advises to cut at least one inch around and underneath the moldy spot to be on the safe side. Then, enjoy your pristine portion of cheese. Wagner also suggests swapping the freezer bag or container for a new, clean one, and “if the knife touches the mold, clean the knife with hot water and soap and dry before moving on to the next cut of cheese.” Oh god. Cheese also has the advantage, Smith points out, of bring stored in the fridge, where the cold temperature will slow the growth of the mold, “so I would predict the hyphae are shorter and less branched than in bread, which is typically stored at room temperature.” She also takes note of a substance’s “moisture level.” Soft cheeses, fruit preserves, and pasta sauces are at higher risk for mold flareups because they’re, well, wetter. Even this bacteria expert says that she’s “very liberal” about expiration dates and will readily scoop off a spot of mold in a jar of pasta sauce and serve it to her kids, who are none the wiser. Last Call: Can you cut out the mold from your bread and still eat it?